The half dollar was produced to raise money to pay for the carving of the memorial to the soldiers of the South on Stone Mountain, and the memory of Warren G. Harding. 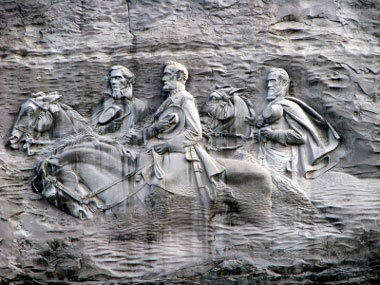 The carving shown above was finished in 1970 and measures 90 feet high by 190 feet wide with images of General Robert E. Lee, General Stonewall Jackson and Jefferson Davis, the President of the Confederacy. The models for the Stone Mountain Memorial Commemorative Half Dollar were prepared by Gutzon Borglum. General Robert E. Lee and Jackson, mounted on horseback, are shown on the obverse. The reverse has an eagle perched on a cliff and the words “MEMORIAL TO THE VALOR OF THE SOLDIER OF THE SOUTH”. The minting of the coin was authorized on March 17, 1924. The first coins were struck at the Philadelphia Mint on January 21, 1925, General Stonewall Jackson’s birthday. A maximum quantity of 5,000,000 were authorized, while only 2,314,709 were actually struck. A total of 4,709 coins were retained for assay and because of low sales 1,000,000 were melted. This leaves a total quantity issued of 1,314,709. The Stone Mountain Confederate Memorial Association distributed the coin at a sales price of $1. Several holders for the coin were used. All are rare today. A wooden box similar to the one used for Lexington-Concord halves, but with a 15/16” silver and blue star on the cover; a Christmas card printed on heavy stock; with coin insert, depicting the “Gigantic Stone Mountain Memorial Frieze” and Augustus Lukeman, this issued in an envelope; a five-coin insert-type cardboard holder; the first 1,000 coins produced were in a ceremonial were placed in sequentially numbered paper envelopes; there were also many unofficial boxes and envelopes issued by various banks, businesses and other organizations. High grade examples of the coin are very rare today.